Most prefab doggie home products on the market tend to be a bit of a snooze: They're plastic or metal, and they're all built for pooches who spend a lot of time outdoors. But what if you've got a canine who sticks to the indoors but still seems to crave its own space in your house? 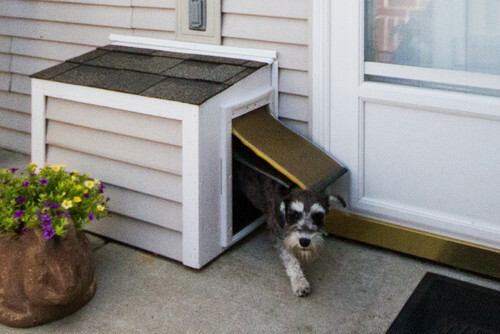 Lucky for you, there are plenty of doghouse plans out there that will make your pup feel right at home, without making your place look like a kennel—or worse. 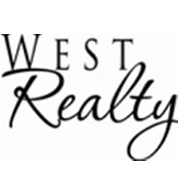 Photo by Baldwin Homes, Inc. 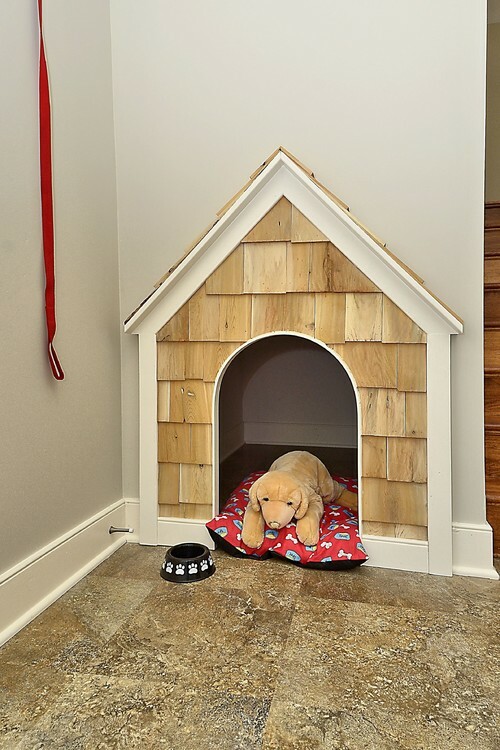 If the space beneath your stairs isn't very useful, break through the drywall to build a doghouse, Harry Potter-style (remember that's where he slept?). Adding wood siding and a peaked roof adds a bit of extra charm to this indoor twist on an outdoor classic. 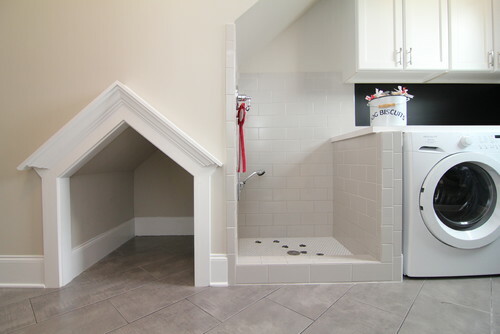 You already laid down linoleum on the laundry room floor to handle wet towels, which makes it perfect for this unique dog house idea. If your pup has an accident in the laundry room, clean-up will be a snap. 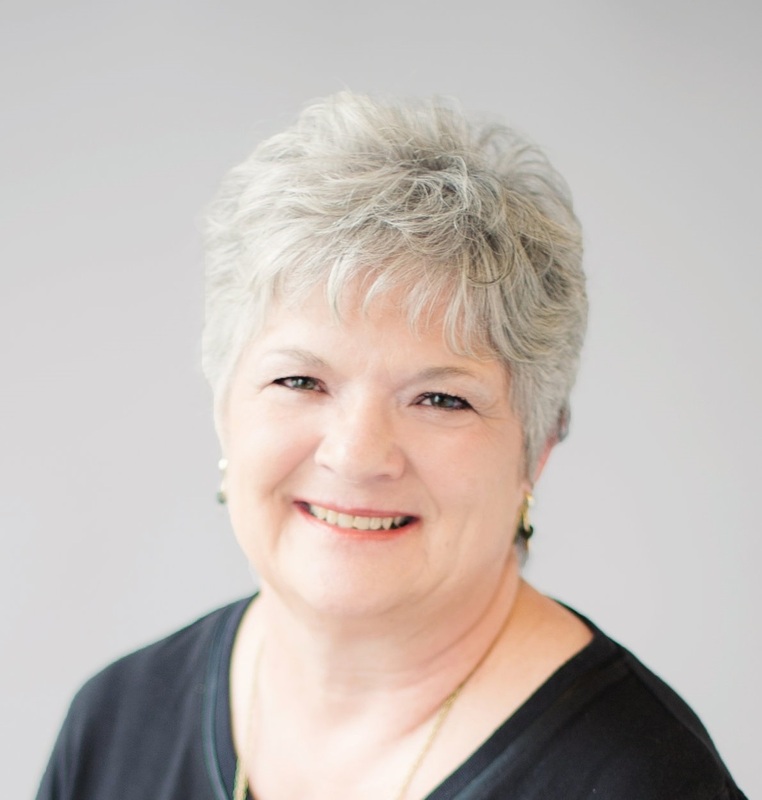 One note of caution: Keep your laundry detergent and dryer sheets up on a high shelf, far away from a counter-surfing dog's eat-anything appetite. Every dog owner knows that coming home to a greeting from an excited pup is one of the benefits of dog ownership. 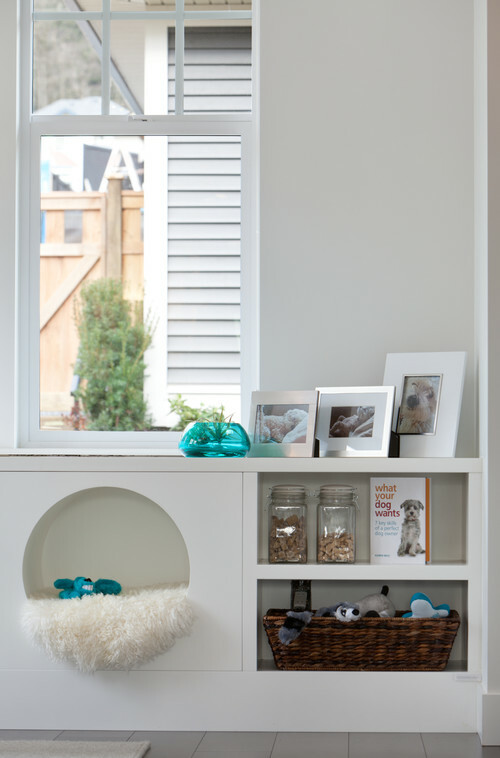 Make it easy for Fido to meet you right at the front door with a doghouse setup that's incorporated into the mudroom furniture. Built like an extra cabinet, it can even have a latching door if your pup likes to be closed in for comfort while you're away. A window seat makes for a perfect place for dreaming ... for you and your dog! Cut out a sleeping area where you might otherwise have unused space. While you're soaking in the sun in the seat, with a good book, your pooch can snooze away in its private space just beneath you. 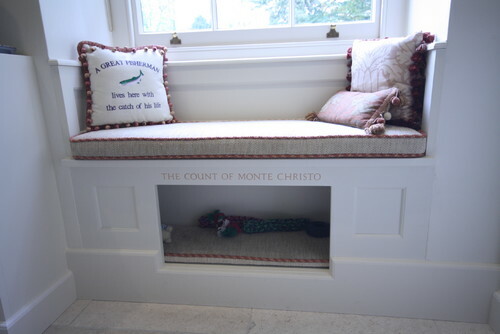 While you're adding organization to the den or living room, add a nook for your dog's naps. Shelves nearby can hold its toys, so they're up and out of the way (or will be, once you scoop them all up and place them in the basket). Kids and puppies go together like chunky peanut butter and strawberry jam, and you'll often find them hanging out together. If your kids and dogs are attached at the hip, make sure the dogs have a perfect place set up in their best friends' playroom.